The film stars local actors Levi Anderson, Danielle Kelly, Brian LeBlanc, Mig Windows & Jazmine Dake, it was written by Kristopher Horton and shot by Ashland photographer Jared Cruce. It features a variety of Rogue Valley locations in Ashland and Talent. In the past decade, Ross Williams and his company, XRATS Productions has worked on a large variety of film and video productions, including local and national TV commercials, recently winning 1st place and $10,000 at a national competition for Tostinos Pizza and is currently in the finals of the Big Rock Brewery international commercial awards. After devoting two years of his life, along with a talented local cast and crew he is launching this short film. His goal is simple – to see how the characters resonate with a greater audience. 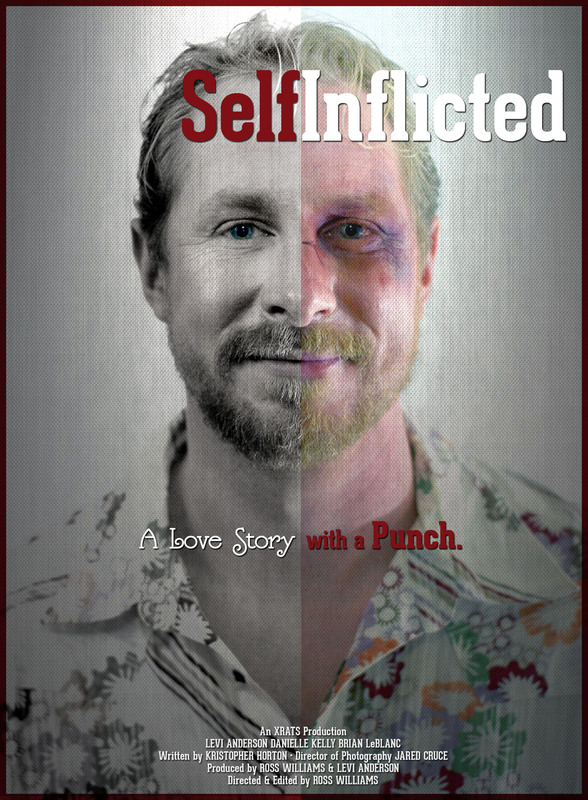 Ross hopes that the local community will participate in the online film launch at www.selfinflictedfilm.com, there you can find links to a pre-order the film, a trailer and a Facebook event, where Ross and cast will be hosting live streaming chats on May 6th to talk with the films new fans.